This is the stage where you have one or more ideas and wish to get a quick sense of which ideas are worth exploring further. Design your idea into a business. Who are your customers? What are they buying? Talk to some people who could be customers, to find out what they think. There are ways of doing this – everyone will tell you the idea is great, but would they buy it? 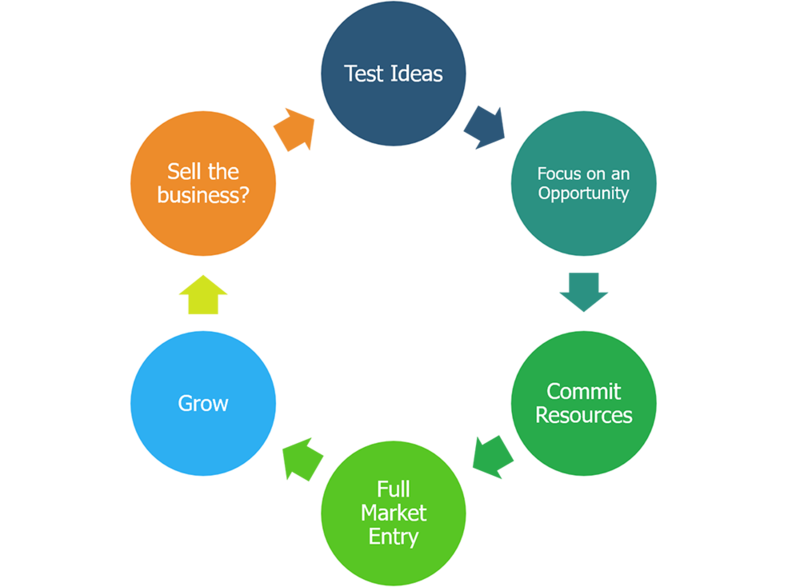 Write a big complicated business plan. It is a waste of time until you need to get investment or a loan. This is the stage where you have narrowed down to one idea that appears to be promising opportunity and now is the time to go for deep dive to flesh out all the business model assumptions. Work out what is the least you can do and the least you can risk getting the business going (called a minimum viable product). Try a few experiments to see what people will really buy. Beg, borrow or steal (!) resources before you buy them. Buy loads of kit to make yourself feel you are getting somewhere! Think sales, sales and sales. This is the stage where you enter the market. You have at least the first version of the product developed, your core team in place and have established your market. You may also look to raise funds from external investors. Build your credibility – get customer references, use everyone as a marketing channel. Only if you need investment, build a business plan. Worry too much about profit. This is all about cashflow. This is the stage where you are established in the market and ready to go to scale. Your customer base is rapidly growing, the operations are scaling up, the headcount is expanding. You must keep pace with rapid growth. You might need investment to grow. Either debt or venture capitalists. Expect your company to be the same. You will have to let go to let it thrive. It is now bigger than you are. You have at least the first version of the product developed, your core team in place and have established your market. Typical exits are an initial public offering (IPO), being acquired by a larger, publicly traded corporation, or a merger. Hang on and try to manage a business that has outgrown you. Maybe start another business instead? After all, you are a professional entrepreneur now!